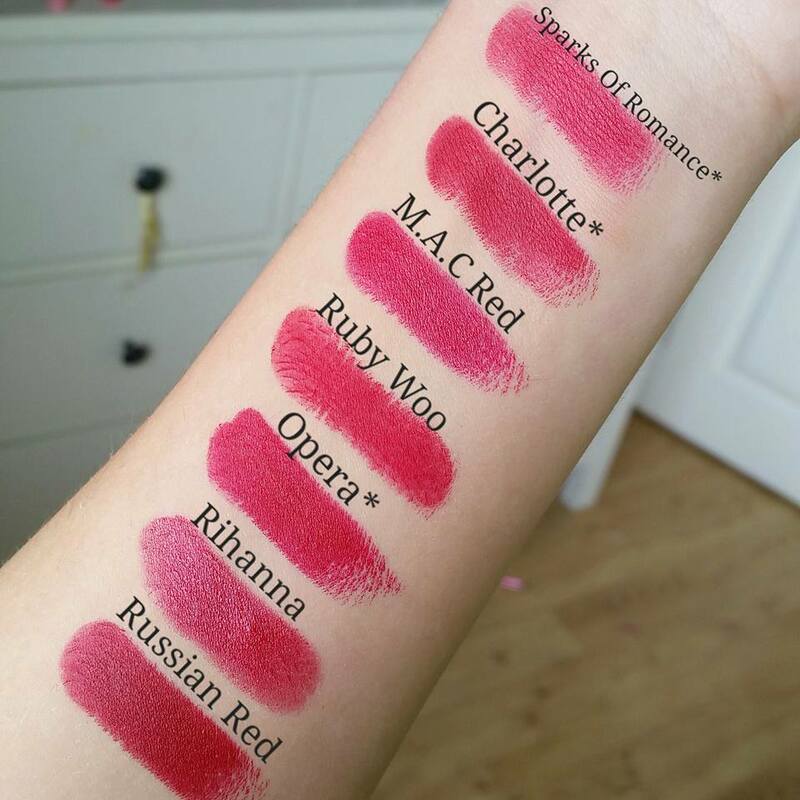 The names with stars* besides them are Limited Edition lipsticks. 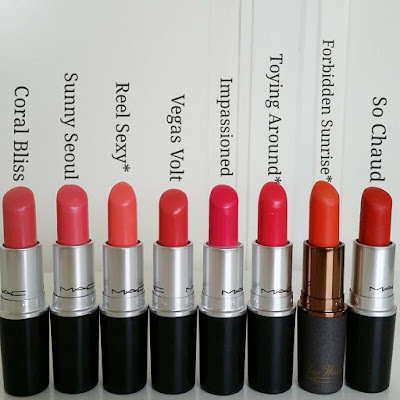 My favorite ones are Forbidden Sunrise* and So Chaud. Vegas Volt would make the Top3. 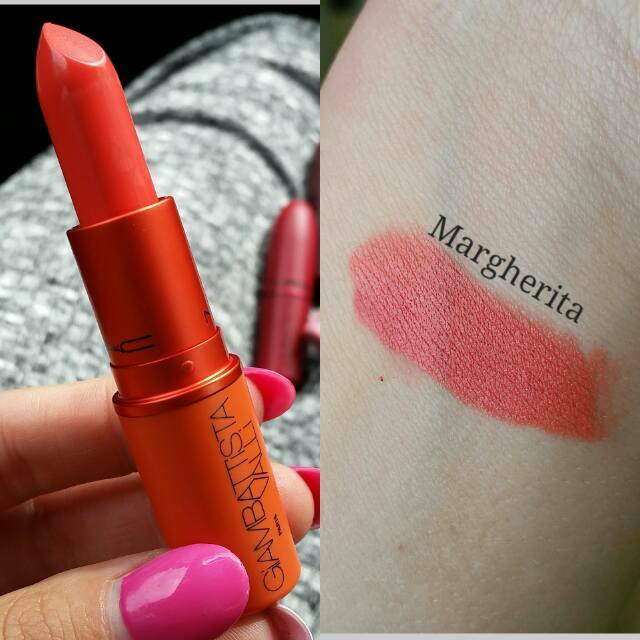 Coral Bliss was my first coral/orange color I got when I just started loving lipsticks. 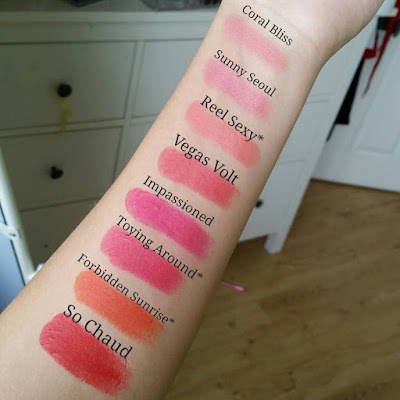 I was more pink lipstick kind of person and Coral Bliss was as far as I was willing to experiment with different colors, but as you can see I have a lot brighter and vibrant colors now because taste in makeup can change really fast. 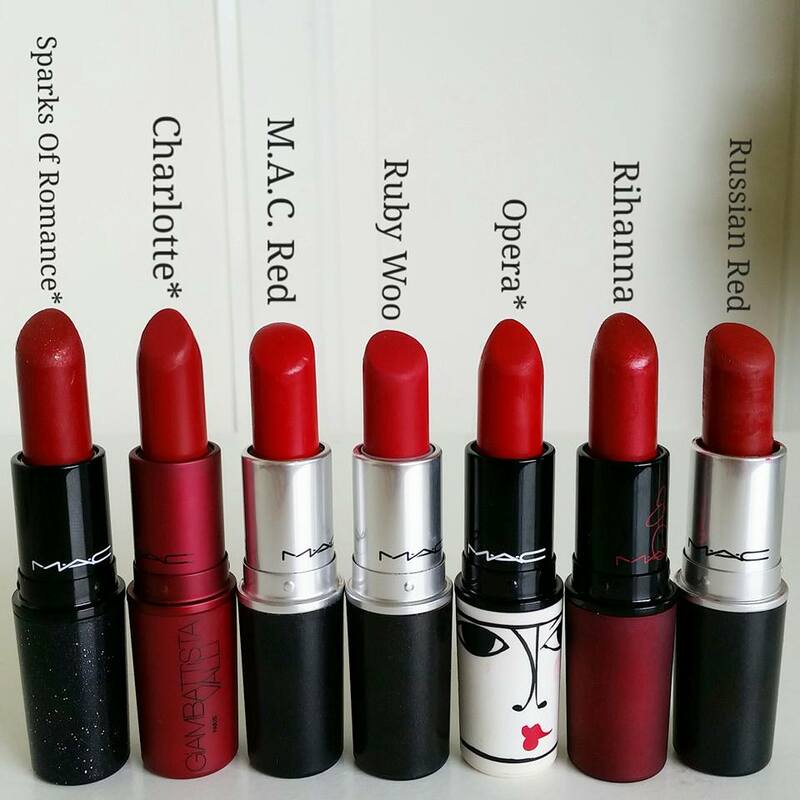 Even tho I don't wear red ofter I do love sometimes a bright red lipstick and one of my favourites would be Rubby Woo and Russian Red. Opera* would make the Top3. I do like all of them but M.A.C Red I have worn once since I got, it and even then I wore it because I made myself to do it, I think it is because M.A.C Red has pink undertones and I don't really like it how it looks on me witch says a lot, because I usually will wear any lipstick. Ruby Woo is extremely drying, I can only wear it when my lips are at the best, because I can not stand when lipstick drys out my lips. 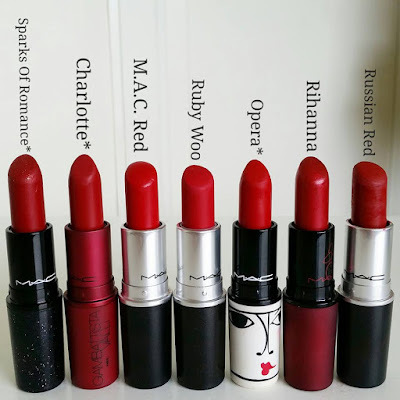 As you can see most of the red lipsticks are matte, reason being red is so delicate to wear and can bleed easily and make huge mess, but by being matte the stay on longer and you will not have your face covered in red lipstick. 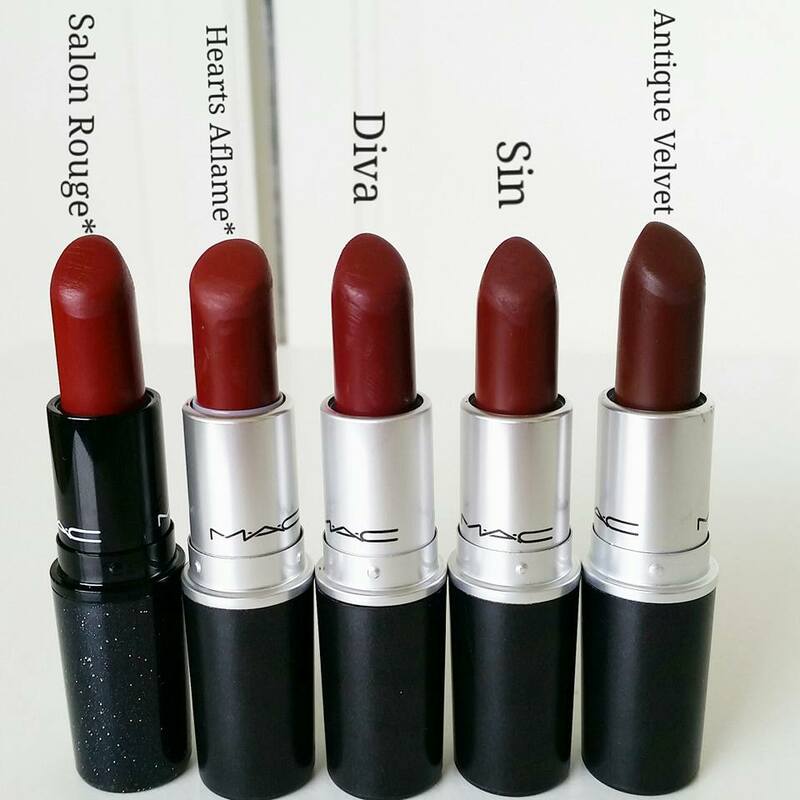 Hands down these are my favorite lipsticks every single one of them, especially for fall and winter.I love dark red/burgundy lipsticks. At least 1 of these is a must have. None of them are overly drying but they will dry out your lips if you have naturally dry lips, so just keep in mind to use lip balm before you apply them. I know Antique Velvet isn't really a red but a brown, but it always stands in my dark red section. 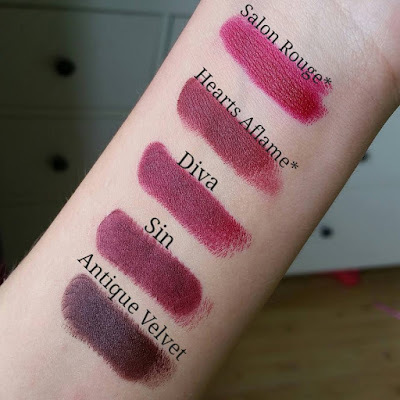 Since Hearts Aflame is limited edition I would say get Diva absolutely stunning lipstick. As you can see all of these are matte lipsticks, witch is good for a dark color, it will stay on longer and wont smear all around your face. My personal favorite finish from Mac lipsticks is Amplified because they are really pigmented and creamy and the staying powder is good for them too. *Retail price for Mac lipstick is 20euro. In Ireland you can get them in Brown Thomas stores or Bt2 stores. The Balm Bahama Mama and Nars Laguna Bronzers. Hi,let me introduce my self.